“Bye, Mandy,” a young student called out to the tall, stylish woman with dark, wavy hair. The boy was on his way out the door, clutching a candy cane, still glowing with pride and enthusiasm following the performance that he and fellow elementary school students had put on that morning at the Isaac Sheppard School in Kensington. 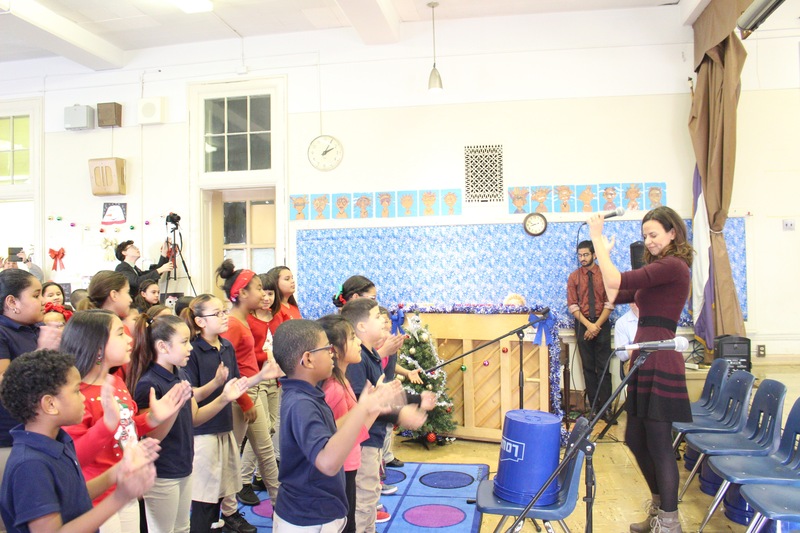 Mandy Gonzalez waved back with a wide smile - she’s not a teacher, parent or a friend, but a Broadway star who had just stopped by the school one bright, early morning in December to spend time singing and speaking with the young students. Gonzalez, a Mexican-American whose father was a migrant worker, will be singing “Remember Me,” the bilingual ballad from the hit movie “Coco,” among other songs, as a soloist at The Philly POPS Christmas concert, which is being held Dec. 1-22 at Philadelphia’s Kimmel Center for the Performing Arts. She told AL DÍA that “for Latinos to come to POPS, and know that we’re represented” is important. The star of Broadway blockbusters, such as "Hamilton," "In the Heights," and "Frozen," Gonzalez wants “everyone to know that everyone is welcome with The Philly POPS and it’s a very important thing.” By visiting schools like Isaac Sheppard, which has a majority Latino student population, she feels she can play a vital part in breaking down barriers in the arts. “This is the first time that we get to sing in Spanish onstage with The Philly POPS, because they said that they wanted to make it cater to me, and I said if you want to make it for me you have to include Spanish. And so we open with Feliz Navidad, and... I feel like I’m home,” said Gonzalez. It is important for her that kids like those Isaac Sheppard see themselves and their stories represented on stage. “I think it changes lives. Because all of the sudden it opens up possibilities, and it allows young people to start dreaming for more, and start to say, as a Latina, my family is never far from me,” said Gonzalez. Gonzalez noted that the effect extends far beyond show business. “With music, it’s about expression. It’s about learning to stand up in front of people, and it doesn’t matter if you decide to be on the stage, if you decide to be in the spotlight, or if you want to be the reporter, or if you want to be the stage manager, if you want to do lighting design. It’s important for you to know that it’s possible, that a life in the arts is possible,” she said. That’s why, for Gonzalez, it is important for her to continually try to represent and connect with young people in communities she visits across the country. “This is just the beginning. Because these kids, one day they’re going to come to Philly POPS, and now they know what it is,” she added. Gilberto Vega, manager of external affairs, said that the emphasis on bilingual education that encourages Latino children and others to speak Spanish is important. “At the start of the semester, kids were saying, ‘Oh, Spanish is boring, I don’t want to learn Spanish,’ and now the kids are saying, ‘Are we going to sing more Spanish after this?’ And I’m like, ‘Absolutely,’” said Vega. 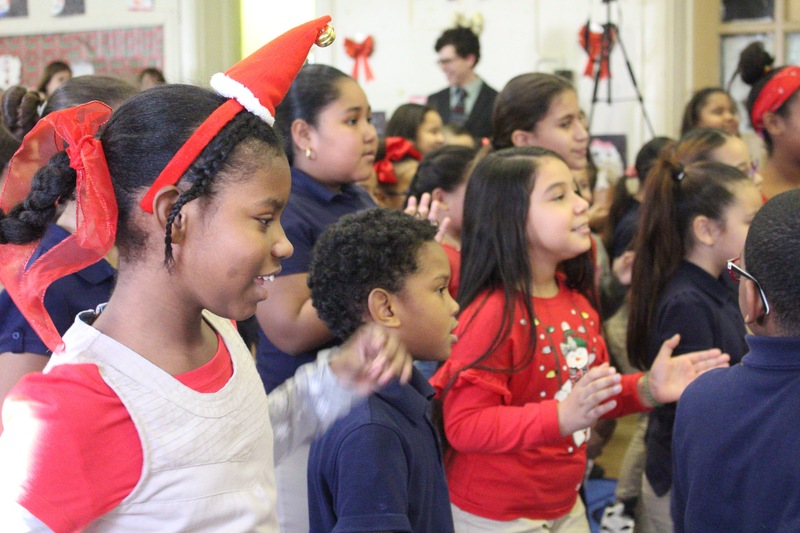 The POPS in Schools program, which serves 15 Philadelphia public schools, is designed to supplement the school district’s regular arts and music programming. It is “particularly a passion” for Corbin since both of her parents attended Philadelphia public high schools. Corbin noted that they are “particularly fortunate” to have Vega, a bilingual Latino, on the staff, as well as other bilingual instructors from Temple’s music education program. “I think that just allowed us to bring an extra something to this particular school,” said Corbin.